The wonderful weather continues here in Ft. Lauderdale but fishing charter catches remain erratic and fish numbers are down, but we are still picking away at an occasional really good fish. We continue to hammer away at the reefs to get the most action possible. Off the edge has only produced small Blackfin Tuna with most being under 5 pounds. The Mahi-Mahi in the area seem to be more inclined to be up on the reef or at least very close in. 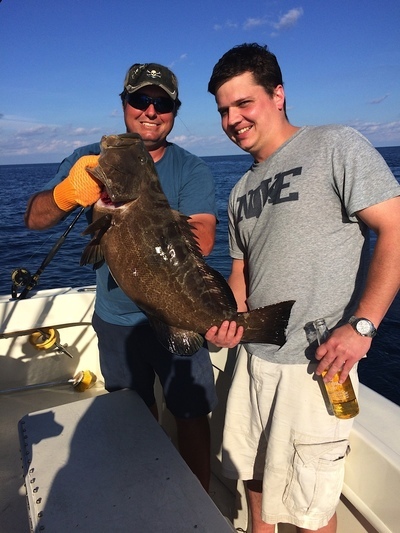 A bright spot has been that we have managed a few Black Grouper and some nice ones at that. That season will be closing on Jan 1st here in the Atlantic so they hit the ice here aboard the Marlin My Darlin until then. That young man in the photo with 1st mate Nate is Pat with a nice Black he landed while fishing with the Brown family who are regulars with us. The rest of the catch was two Mahi, two Kings, one of those small Tuna and medium sized Bonitos. Tried the Snappers but they were under sized and we tossed them back. On the slow side for sure yet everyone enjoyed the trip, especially me as it’s always good to see familiar faces, and the Browns as well as they have had some good ones to go along with this slower one. Nice weather, good company and the Brown’s beer was cold on a trip with friends where we plugged away and caught what was available. We’ll start afresh tomorrow morning and see what the day brings. The weather is going to change with an approaching front and we’ll see what it brings.